We spend the majority of our days during the winter with a high of 60 degrees and mostly sunny. (I know, some of you are cursing me under your breath right now. Sorry.) So when we heard the rumors that snow had come to the Middle Atlas mountains in Morocco we grabbed some friends and headed that way for a long weekend. We were going to Azrou, a town of 50,000, in a valley of the Middle Atlas mountains. It is just south of Ifrane, a more popular European-ish town/resort area. The day before we went, Joe's bible study leader mentioned that Azrou is the same size Jerusalem was in Jesus's day. As we approached the valley from above, it was easy to see how any important news (like the triumphant entry of Jesus, Palm Sunday) could spread so quickly: the town is laid out with buildings close together, a few stories high, and barely room for cars in-between. Random tangent but interesting nonetheless. About 1.5 hours into the drive we came to the mountains and after cresting one hill and then another, us adults started sweating: there was no snow. The kids had been promised snow and sledding, packed their gear, and had been in anticipation all week. As the miles went by and we were 2 hours into the 2.5 hour drive and still no white, they were downright panicking. About 15 minutes from the hotel we finally spotted snow on a distant peak and knew we were saved! We pulled into the hotel parking lot and there was one small pile of ice/snow that hadn't melted. All the kids (that could walk) pounced on it like it was the last snow on earth. The freezing temperatures were quite a shock- especially since we had only been in the car for 2.5 hours. We stayed at Le Palais de Cerisiers (Cherry Tree Palace), a small family-run lodge with nice rooms and a great restaurant. Our families were assigned rooms that opened onto the same landing allowing the kids to run back and forth. The food was good and they catered to the kids' tastes (spaghetti and french fries instead of roasted duck and asparagus) and schedule (6:30 dinner instead of 8:00). The daytime was spent playing in the snow, sledding, and hunting for wild monkeys. 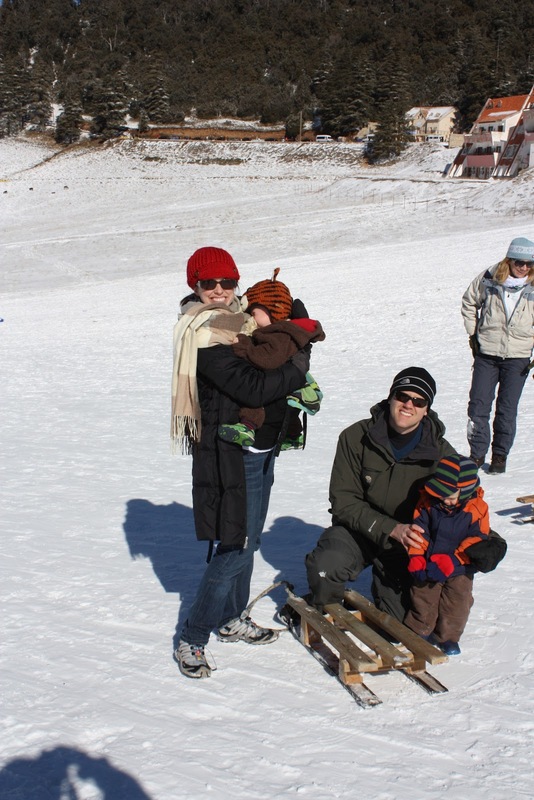 The first day we went sledding at an actual "ski area" that had lifts and everything. They didn't work, probably hadn't since '93, but they were there. In front of the hill many enterprising Moroccans are ready to rent you all manner of equipment for snow sports. Skis and sleds, of course, but also snow boots, rubber rain boots, etc. We rented a sled for $3 for the day. Not too shabby. The best picture we could get of the 4 of us. J is screaming at the top of his lungs at this point. G and I taking off down the hill. You will notice that I am not wearing my coat- and not because it wasn't freezing. The walk up the hill was pretty treacherous for G's little legs and Joe had warned me that after taking 5 steps back up the hill with G and sled in tow, I would be burning up. And I was. Good call. Our friend Brent is in the background trying to take a video with his iPad. They didn't turn out. A Barbary monkey. A troop of these live just 5 minutes from the hotel. The second day we took an easier route and headed just up the hill from the hotel...or Palace, I should say. Anyhow, out on the side of the highway if there is a good sledding hill, there are men waiting to rent you a sled. They just perch all the sleds/skis up in the snow and are open for business! This is right on a major autoroute. You can tell how large the hill is by the size of the people in the background. We ran into problems as the day went on and more Moroccans showed up. First of all, they CANNOT stay on their sleds. So they climb to the top, start down, fall off, and then the sled continues on down the hill like a missile running over anything (little children) in its way. Also, did you know that a great place to play soccer is in the middle of a sledding hill? Oh yes, especially for GROWN MEN. Might anyone get hit with the ball while sledding? Um, yes, that would be me. Did said players acknowledge that someone had been nailed with the soccer ball? I bet you can answer that one on your own by now! Before dinner the kids would cuddle up and watch a movie while the adults had a little wine across the hall. This was the first time G had ever sat and watched a movie with a group- so cute. And love K's little hand resting on his leg. We hear about K every day now! On Sunday, out of desperation, our little family ended up at the Michlifen Resort for lunch. Remember how I went on and on about how nice the Sofitel Rabat is? Well, it PALES in comparison to this place. So there we were with toddlers in an expensive restaurant. Thankfully, we had the place to ourselves AND they found some french fries for G. ALSO, do you see what J is sitting in??!! An actual high chair!!! That alone was worth the exorbitant cost of the meal. Although he looks happy here, I can't say the weekend was a success for J. We didn't have proper clothing for him to crawl around in the snow AND we were in many places with floors that I was unwilling to let him crawl on. So he was pretty mad. However, I finally figured out how to sled with him and that was a big hit. I should also mention that the biggest single factor of this trip, as far as Joe and I were concerned, was the fact that we would all be sleeping in one (small) hotel room together. We had been worried about this for some time, and had even tried to do a practice slumber party the weekend before the trip, which was a DISASTER. Thankfully, the boys rose to the occasion, and while none of us slept as deeply as usual, they did sleep pretty solid from about 9 pm to 5 am both nights. Not bad for the first time out. All in all, a good trip. Enjoyed the snow, but nice to get back to 60 degrees. And to the Bs and Es, we loved every minute with ya'll. Thanks for a great time!